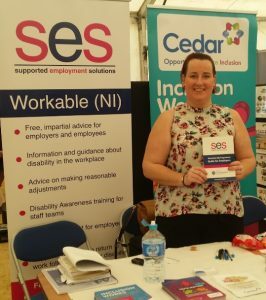 SES attended the recent E2E ‘Education 2 Employability’ Event in Ebrington Square. As well as informing the community about the exciting educational and employment opportunities available locally, there was also a number of fun events for people of all ages and families. The innovative event featured a number of interactive showcases and exhibitions from a range of leading learning and industry organisations who were exhibiting within three large marquees, each having a separate theme – Showcase, Interaction, and Employability. Many organisations were offering job opportunities on the day. One such organisation was local company Errigal Contracts who was offering 16 Full-Time Apprenticeships positions in the area of interior design systems. SES were able to advertise their vacancies throughout the partnership. Staff from the Western Trust took part showcasing the wide range of careers and job opportunities available locally in the health and social care sector. Live music and entertainment took place all afternoon, there was culinary demonstrations, and dozens of fun and informative activities. W5 were on site with a Minecraft demonstration, the local fire service carried out an emergency demonstration and Ulster University brought their interactive robot. Well done to all involved and here’s to the next one!